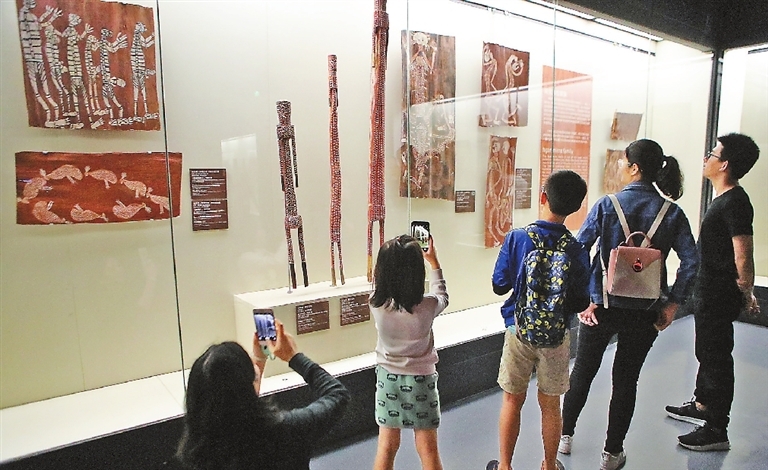 BEAUTIFULLY composed bark paintings, one of Australia’s great cultural treasures and one of the world’s oldest continuing art traditions, are on display at the newly-opened “Old Masters: Australia’s Great Bark Artists” exhibition at the Shenzhen Museum. Although the title is “Old Masters,” the 120 exhibited items, on loan from the National Museum of Australia, were made between 1948 and 1985. “While these works were painted in the 20th century, the images, symbols and stories have a very long history, produced and reproduced over time,” said Dr. Mathew Trinca, director of the museum in Canberra, at a lecture in Shenzhen on Sunday. “Aboriginal people have been in Australia for 65,000 years. Painting on bark has been done by the Aboriginal people of northern Australia in Arnhem Land for many thousands of years. They also paint on rock, cave, shelter and the body. These designs at the exhibition are very old and the same motifs and images recur,” he added. The exhibition features 41 artists, many of whom were ritual leaders, statesmen and cultural advocates. It is organized according to the three stylistic regions of Arnhem Land: the west, where figurative images predominate; the east, where the emphasis is on geometric and conventionalized imagery; and the central, where artists tend to combine both approaches. Aboriginal Australians paint on bark that is stripped from trees and then flattened. The pigments, the red and yellow ochre, are drawn from the earth itself. “In this way, the paintings are indivisible from the land as they witness the lives of the Aboriginal people who made them,” said Trinca. Until the 1960s, the ochre was mixed with binders such as egg yolk and orchid juice to make paint. Since then, most artists have used water-based resin binders instead. Traditionally, bark paintings were produced for instructional and ceremonial purposes and were transient objects. Today, they are keenly sought after by collectors and public art institutions and are stored with a humidifier. The National Museum of Australia has more than 2,200 works, the world’s largest collection of bark paintings. “The artists are truly ‘old masters’ who use their art making consciously as a means to communicate with the broader Australian public. 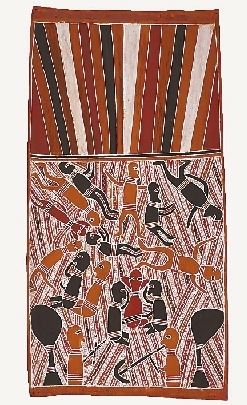 In 1963, Indigenous Australians in Yirrkala sent a petition framed by painted bark to the Parliament of Australia, asserting the rights of Aboriginal people. These political meanings are deeply implicated in making a dynamic society of Australia today. Understanding its past is within the context of the present,” said Trinca. Trinca told the Shenzhen Daily in an interview that more recently, the Aboriginal people still live in the country but also have some of the benefits of the Western world. They have schools and art centers. Most of the conditions at Yirrkala, for instance, are like those of a village. The old techniques have been maintained as a practice, while some artists experiment with the form. The “Old Masters” exhibition has detailed Chinese and English captions and visitors can scan the QR code on the label of each item to know more about symbols and designs. Entry is free.